When the material handling and logistics industry’s premier event, ProMat 2017, opens on April 3 it will include over 850 exhibits and more than 100 educational sessions on technology and equipment that can help you keep moving forward to increase the efficiency of your supply chain operations. If you’re attending ProMat 2017, you’ll want to make very second count and view the full range of solutions to make your supply chain more competitive. 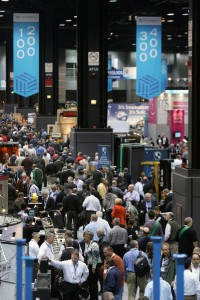 Go to the ProMat website to review the full conference program by time and topic to help build your session schedule. Of course, we’d like you to visit TZA at booth S579 for an opportunity to meet with our labor management experts and view demonstrations of our ProTrack Labor Management Software for distribution, manufacturing and delivery operations. Also plan to join our ProMat 2017 panel discussion on “Leading Your Workforce to the Next Level of Performance” on Wednesday, April 5 at Noon. Learn from three supply chain executives on how they are transforming their workforce: turning average performers into rock stars and changing supervisors into performance coaches.